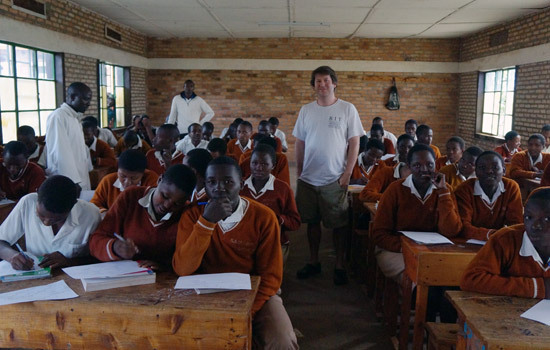 Brian Tomaszewski, assistant professor of information sciences and technology, visits students at San Phillipe Neri in Gisagara, Rwanda, participating in the pilot study. A few hundred teenagers in Rwanda are about to walk out of their science classrooms and map their world using smart phones and tablet computers provided by two scientists from Rochester Institute Technology. The community-mapping project asks the students to think like scientists. Whether this leads some of them to science careers or to advocate for climate-change measures, the experience will give them problem-solving skills and a new perspective. RIT professors Brian Tomaszewski and Anthony Vodacek are implementing high school science curriculum centered on geographic information systems (GIS) technology. Their two-year pilot study is funded with £294,712 ($473,000) from the U.K. Department for International Development in support of the Innovation for Education, a national initiative the Rwanda Ministry of Education launched earlier this year. The project is one of 26 programs the ministry will consider adopting as national models. The curriculum Tomaszewski and Vodacek developed will train 225 high school students in the Huye and Gisagara districts in southwestern Rwanda to map the natural resources in their communities using tablet computers and smart phones. The students will learn to use the geographic information system technology embedded within the electronic devices to collect and synthesize data from their surroundings. The assignments will teach them the spatial-thinking skills needed to navigate and make their own maps. Spatial thinking uses the properties of space, such as scale, distance and direction, to structure and solve problems ranging from simple navigation with a map to complex scientific inquiry, Tomaszewski says. It drives his research about the science behind geographic information systems—information tools and interactive maps—and Vodacek’s use of remotely gathered imagery to study land cover change, monitor wildfires and assess water quality. “My interest in mapping technology coupled with Tony’s interest in environmental science gives our collaboration a really great synergy,” says Tomaszewski, assistant professor of information sciences and technology at RIT. Their project focuses on three high schools in Rwanda. Two schools will receive the spatial-thinking curriculum, tablet computers and smart phones; the third school will serve as a control to statistically verify the program’s impact, Tomaszewski says. The students will use computers equipped with the Android operating system to run open-source mapping technology. The availability of free software makes the community-mapping program feasible as a pilot project and, possibly, implemented on a national scale. Customized mapping software was developed at RIT during the summer by Nick Holt, an undergraduate from Furman University attending the National Science Foundation-sponsored Research Experience for Undergraduates program for imaging in the physical sciences at RIT’s Chester F. Carlson Center for Imaging Science. Loaded onto the Android devices, the software will give the high school students mapping tools for gathering data about their local environment. Students will gain valuable skills while making maps that will benefit their community. Their maps will synthesize data about local agriculture, weather, water quality and infrastructure. In August, Tomaszewski benchmarked the students’ spatial thinking abilities. Preliminary results testing reasoning and navigations skills favored middle-class male students from the urban school in the study. (The study is designed to impact similar numbers of boys and girls.) Tomaszewski will reassess the students in June 2014 and March 2015. They hope the curriculum and the technology inspire teachers and ignite students’ imagination. “I would love to see if some of the students are interested in the actual programming of these Android devices and write their own apps,” Vodacek says. Participating teachers underwent training in mid-September. Tomaszewski met with the group in Butare, Rwanda, and introduced them to the spatial-thinking concepts they will integrate into their classes. Tomaszewski and Vodacek manage their long-distance project with assistance from partners on the ground. Team members from the Rwanda Environmental Conservation Organization will instruct the students in conducting fieldwork. Colleagues at the Center for Geographic Information Systems and Remote Sensing at the National University of Rwanda will provide technical support. Data that the students collect will feed into a related remote-sensing project that Vodacek began with funds from the MacArthur Foundation. Bikash Basnet, an imaging science Ph.D. student in the Center for Imaging Science, will continue to map land cover in Rwanda. Vodacek is separately supporting Basnet's involvement in the new Innovation for Education project. As part of the Innovation for Education program, two graduate students were recruited from the National University of Rwanda. Kigali residents Jules Karasira is studying geographic information science under Tomaszewski and Donath Uwanyirigira is pursuing remote sensing with Vodacek. The students will complete their course work at RIT and return to Rwanda to conduct thesis research supporting the Innovation for Education project. Underscoring the connection between RIT and Rwanda is Manasse Mbonye, former RIT physics professor and current National University of Rwanda Acting Rector.